Researchers have tested a range of variables in horses in a bid to identify factors that affect platelet concentrations in platelet-rich plasma preparations. Platelet-rich plasma – blood plasma that has been enriched with platelets – has been shown to be safe and effective in promoting natural processes of soft tissue healing or reconstruction in humans and horses. However, variability in platelet concentrations have been observed in practice between platelet-rich plasma preparations from different patients or from the same individual under different conditions. Researchers from the University of Bologna in Italy wanted to see if environmental variables influenced platelet concentrations in horses. Six healthy standardbred mares were used in the study, the findings of which have been reported in the open-access journal Acta Veterinaria Scandinavica. They were exposed to six different variables with a one-week washout period between variables, and platelet-rich plasma was subsequently produced from the blood drawn from each horse. The variables were drawing blood at 7am (Day group), at 7pm (Night group), during a state of dehydration, over-hydration, treatment over five days with the non-steroidal anti-inflammatory drug (NSAID) ketoprofen, and training time on a treadmill. In each case, 450ml of blood was harvested from the jugular vein. 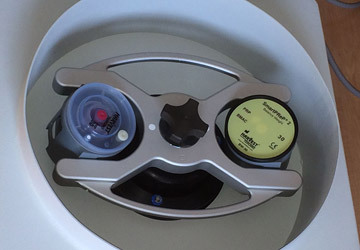 The separation of the blood cells was carried out within three hours after the sampling using a refrigerated laboratory centrifuge. Noemi Romagnoli and her colleagues found that platelet concentrations were significantly higher in horses treated with ketoprofen. The leukocyte concentration increased 2–9 fold with respect to whole blood in the platelet-rich plasma when compared with the Day group. A higher white blood cell concentration was measured in the platelet-rich plasma of the dehydration group as compared with the Day group and this difference was statistically significant. “The results demonstrated that the platelet concentration in platelet-rich plasma was significantly higher in horses treated with NSAIDs as compared to the Day group. “However, it was not possible to find any significant differences associated with the other variables,” the study team reported. They said a difference was detected between the Day and Night sampling in the white blood cell concentration in the platelet-rich plasma. “Clinicians should be aware that the effects of platelet-rich plasma are based not solely on platelet concentration, even though many of the reparative factors are contained in the platelets. The researchers said the influence of ketoprofen on platelet concentration in the prepared plasma was probably due to decreased platelet aggregation, as with other NSAIDs. Ketoprofen was selected for the study due to its frequent use in horses. “During platelet-rich plasma preparation, the presence of NSAIDs in the blood would prevent the production of tromboxane A2 by platelets since it is a strong platelet aggregating factor. The researchers said environmental variation in platelet concentrations should be taken into consideration during platelet-rich plasma preparation. Romagnoli was joined in the study by Riccardo Rinnovati, , Fabio Gentilini, Carlotta Lambertini and Alessandro Spadari. The full study, published under a Creative Commons License, can be read in full here.